After going through this ultimate guide to cheap workout clothes, you will forever be on the lookout for gym clothes on a budget because you will realise just how cute and of good quality cheap activewear can be. This post is a roundup of awesome workout Capri pants for running, Capri pants for yoga and just leggings for warmer weather. Also featured in this post are a few of the best sports bras for large breasts; the best sports bras for running and the best sports for mid and low impact exercises such as spinning, weight lifting, walking, pilates, yoga etc. 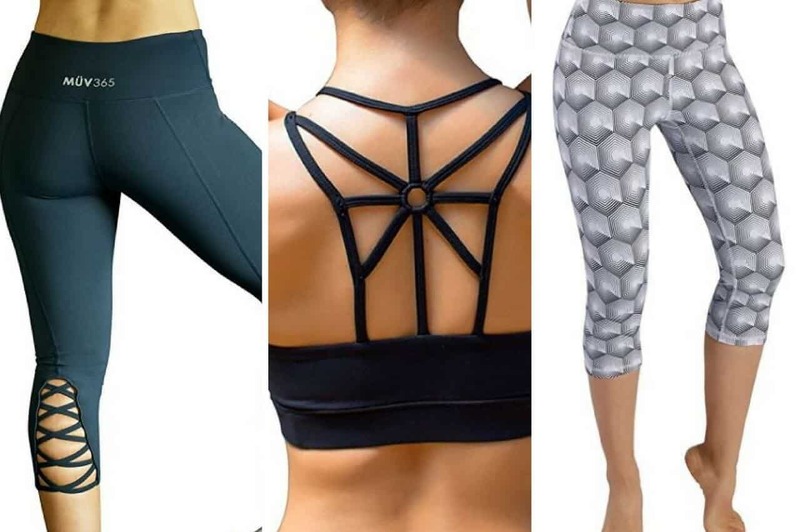 All these amazing workout clothes featured in this roundup are available on Amazon and as the title suggests, you can buy these workout Capri pants and sports bras for only a few bucks. 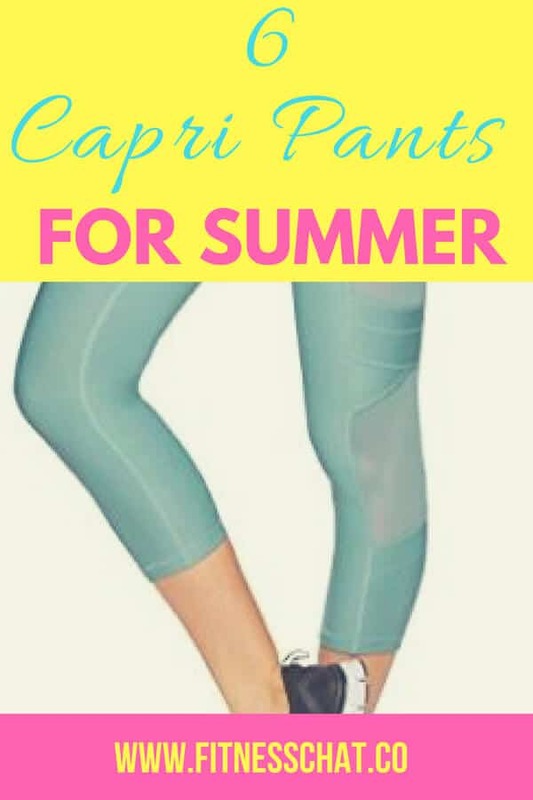 Apart from looking super fancy, Capri pants are great for spring and summer when full-length workout leggings become uncomfortably hot because of the heat. The best workout leggings for summer are the ones that are lightweight, breathable and affordable. The RBX Capri tights with mesh Inserts and X Straps are available in24 gorgeous patterns! They stay in place during a workout and you will not have to worry about them riding low. If you are looking for cute capris pants with trendy prints, then the ODODOS Power Flex tummy control leggings are for you, with 10 different styles to pick from. The yoga capris by 90 Degree are lightweight, available in over 6 colours and best of all, they are not see through. The leggings have a hidden pocket for things such as bank cards, cash or phone. The coolest thing about these capri pants from Under Armour is the lightweight fabric that the Capri tights are made of which will regulate your temperature during your workout. These Capri leggings are available in black, dark blue and black grey and have a side pocket for convenience. The Nirlon capris are one of the best leggings for running and they come in two colours- navy blue and black. The yoga Capri pants are made from exceptionally soft and non-see through material. You will love them because they are compression capri pants with a high waistband that will stay up during your workouts. RBX is really known for insanely cute and cheap workout clothes and these ankle leggings are available in 19 eye candy patterns and colours. You will fall in love with at least 5 of them once you check out these Capri pants on Amazon. These sports bras are the best when it comes to offering support during mid-impact activities. They fit quite snugly, and the straps will not dig into your skin, best of all they are also recommended for girls with large breasts. There you have it sisters, these are some of the cheap workout clothes whose prices do not compromise on quality. What did you like? Let me know in the comments sections. These do look like some fabulous workout clothes. I tend to buy mine when they go on clearance. I jog daily and I don’t care how I look since I’m in pain and I just want it over with. I love that you can save money on workout clothes without having to sacrifice the quality. These all sound like great brands to get if you’re looking for cute and styling workout clothes that are also affordable! These sound perfect for folks whose appearance while they are working out matters. I wish bras were inexpensive, sadly I’ve never seen one that fit me that was. These look really cute workout clothes to wear. Will have to show my daughter. She will find something she likes. Love my capri workout leggings. They stay cool and they’re really cute. I’ll have to check out some of the ones you highlighted. I love the colors. These workout clothes all look lovely. I am currently in need of a good sports bra and the ones you featured in this post look lie they will really provide me with the right support as well as comfort and style. Thanks for sharing this. I am checking them out. Lovely pieces! I think these are really nice, I especially like Under Armour. The quality is exquisite and the price is affordable. I like their designs as well. I love buying from Amazon, I always find great prices! I’ll have to check these out because these are all great picks, and I need some new workout clothes. Oh this is a great picks! I am glad I came over this website. Perfect for me since I just started going back to yoga. Thinking of buying work out clothes and these are what I am really looking for. I believe in cute work out clothes, they make my workouts better. I’ve fallen off the fitness wagon but new fitness clothes help me get back on. I like the sports bras with the back details. These all look cute and comfy – nice to know of some workout wear that is inexpensive. I’ll have to check these out, as I could use some new items in my wardrobe. I love workout legging! I want everything on your list. Especially the RBX Active Ankle Leggings with the side detail and the race back bra. So cute and trendy! You had me at cheap, LOL!! I am all about a cute workout outfit but I hate spending tons of money on clothes to workout in. I will def check these out! Cute, comfortable and cheap, you’ll get no complaints from me. I just bought a new Capri set and will check these out because I need more pieces for warm weather workouts. I will definitely go for comfort and also the style. These options are all very lovely! Love to check and compare these items so that I can purchase my workout clothes. Funny, I am always on the lookout for athleisure on sale from the store I love to shop. I think half of my closet consist of fitness clothes! I love wearing capris when I work out. They are my favorite clothes. I would love some of these clothes for working out. I hate breaking the bank with clothes that cost too much. Awesome workout clothes that are also affordable! Love the styles and it’s good to know that there are always workout clothes that could fit our budget! I really like everything you featured! Nice collection! I love your choices. These selection featured here looks amazing and it will be great to wear them during my workout. I will definitely give them a try. Thanks for sharing.